It’s quick and easy to get going. I love the way you can select your demographic of the Facebook users you want to see the ad. As most of our customers are mothers of kids, I tried to get this selection when setting up the ad. Unfortunately Facebook doesn’t store any information on whether the member has kids or not. This is a pity. So I had to do my best to get as close to our ideal selection as possible. I did this by selecting women over 27 and under 50 – either married or in a relationship. It’s the best I could do – I hope this isn’t sexist or anything!! The only problem with this is I could never see the ad actually appear on a Facebook page as I don’t meet these criteria! We were getting between 8 and 12 clicks per day with an average of about 10. The click through rate was very low – it varied between 0.07% and 0.14%. For instance yesterday I got 12 clicks out of 9,019 impressions which is a CTR of 0.13%. By comparison, our Click through Rate for one of our Google Adwords campaigns was 2.45% for the last week. This difference is understandable – by its very nature the CTR for Facebook Ads will be a lot lower than for Google Adwords. I set the budget to $5.00 (€3.87) per day. And I originally set the cost per click to $0.60. After a few weeks I reduced the cost per click to $0.40 and then the number of clicks I got per day increased slightly. On most days we were only charged between $3 and $4. Facebook Ads compare quite favourably with Google Adwords. Visitors from Facebook Ads viewed an average of 3.72 pages and the Bounce Rate was 33%. The comparable figures for Google Adwords in the sample period was 5 pages per visitor and a 29.5% Bounce Rate. I am quite happy with Facebooks results here considering that visitors from Google Adwords are expressly looking for a product while the visitors from Facebook are clicking the ad they happen to notice while they were going about their normal Facebook activities. I enjoyed trying out Facebook Ads for PuddleDucks. We got good traffic but the conversions to actual sales were quite poor. The future benefit of the Facebook Ad traffic is not tangible but I think it can show positive benefits for brand awareness and hopefully some of these visitors will come back, independently of Facebook and purchase at some time in the future. Now that we have used up our free $100 advertising I think I’ll pause it for a while and think of other ways we can use the Facebook Ads in the future. Maybe promote specific products (with clicks to specific landing pages), maybe do something for the Christmas market and maybe bring visitors to our Facebook fan page rather than the website home page. I’ll continue with Google Adwords as it always brings satisfactory sales. In the meantime I’d be interested in hearing of anyone else’s experience of using Facebook Ads to generate sales. I just need one number to calculate the difference in cost per conversion. So, what is your CPC for Google Ads? @keeplefty. Thanks for the comment. Answering your question: The average CPC for Google was €0.30 which means a cost per sale of €6.00 (at 5% conversion rate). In comparison the cost per sale for our Facebook campaign, at a 1% conversion rate and a CPC of €0.40 is €40.00. A big difference! That is surely a big difference in cost per sale. But I think it is a bit like comparing apples and peaches. Facebook Ads are more like Banner Ads, because the consumer is not in search mode as with Google Adwords (on the search result page, that is). What I am trying to say, is that Facebook Ads (like traditional banner ads) besides conversion rate must be evaluated on their branding effect. Have you for instance experienced greater search for “PuddleDucks” caused by your Facebook “campaign”? @keeplefty Very good point. I agree that there is always going to be a difference in the conversion rate betwen Adwords and Facebook Ads due to the mode that the user is in at the time. I suspect that Facebook Ads will perform better than banner ads due to the demographic filter that is used when setting up the ad. 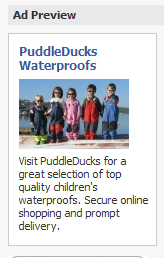 Unfortunately I don’t have any data on whether the Facebook campaign resulted in any greater search for “PuddleDucks”. Great post. Thank you for your candor and the clarity of your analysis. I am trying FB ads to support a novel that has been very successful with readers who have purchased, but remains undiscovered due to poor marketing on my part. It seems that this sort of advertising is very expensive for a product with a unit margin as low as a novel. The question in my mind is whether or not the conversion rate will improve significantly given the low price tag. I did think your ad was very well done, BTW. If anything it really boosted your CTR and the likelihood of a sale on the landing page. So maybe you could create a landing page with a signup form so you can get the visitors email address to send them further information at a later date.